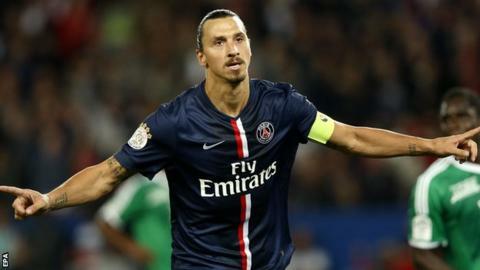 Zlatan Ibrahimovic scored a hat-trick on his return from injury as French champions Paris St-Germain thrashed Ligue 1 rivals St Etienne. A farcical own goal by away keeper Stephane Ruffier, who failed to control a routine backpass and allowed the ball to roll in, set PSG on their way. Ibrahimovic doubled the lead just before half-time with a firm header. He intercepted a backpass for the third, then completed his treble after Edinson Cavani curled in a fourth. Laurent Blanc's men have taken eight points from their opening four matches, two adrift of early leaders Bordeaux. Match ends, Paris Saint Germain 5, St Etienne 0. Second Half ends, Paris Saint Germain 5, St Etienne 0. Marco Verratti (Paris Saint Germain) wins a free kick in the defensive half. Foul by Benjamin Corgnet (St Etienne). Ismael Diomande (St Etienne) is shown the yellow card for a bad foul. Lucas Moura (Paris Saint Germain) wins a free kick in the defensive half. Foul by Ismael Diomande (St Etienne). Blaise Matuidi (Paris Saint Germain) wins a free kick in the attacking half. Foul by Renaud Cohade (St Etienne). Corner, St Etienne. Conceded by Marquinhos. Attempt saved. Max Gradel (St Etienne) right footed shot from the centre of the box is saved in the centre of the goal. Corner, St Etienne. Conceded by Blaise Matuidi. Attempt blocked. Moustapha Bayal Sall (St Etienne) header from the centre of the box is blocked. Assisted by Renaud Cohade with a cross. Attempt missed. Renaud Cohade (St Etienne) right footed shot from outside the box misses to the left. Assisted by Benjamin Corgnet. Foul by Gregory Van der Wiel (Paris Saint Germain). Max Gradel (St Etienne) wins a free kick on the left wing. Attempt saved. Jean-Christophe Bahebeck (Paris Saint Germain) right footed shot from outside the box is saved in the centre of the goal. Assisted by Javier Pastore. Attempt missed. Kévin Théophile-Catherine (St Etienne) right footed shot from long range on the right misses to the left. Assisted by Benjamin Corgnet. Attempt blocked. Benjamin Corgnet (St Etienne) right footed shot from the centre of the box is blocked. Assisted by Kévin Monnet-Paquet with a cross. Foul by Lucas Moura (Paris Saint Germain). Franck Tabanou (St Etienne) wins a free kick in the defensive half. Substitution, St Etienne. Ismael Diomande replaces Ricky van Wolfswinkel. Substitution, Paris Saint Germain. Jean-Christophe Bahebeck replaces David Luiz. Substitution, Paris Saint Germain. Blaise Matuidi replaces Zlatan Ibrahimovic. Goal! Paris Saint Germain 5, St Etienne 0. Zlatan Ibrahimovic (Paris Saint Germain) right footed shot from the centre of the box to the bottom right corner. Assisted by Marco Verratti with a through ball. Foul by Kévin Monnet-Paquet (St Etienne). Maxwell (Paris Saint Germain) wins a free kick in the defensive half. Corner, Paris Saint Germain. Conceded by Benjamin Corgnet. Corner, Paris Saint Germain. Conceded by Kévin Théophile-Catherine. Offside, Paris Saint Germain. Marco Verratti tries a through ball, but Maxwell is caught offside. Foul by Ricky van Wolfswinkel (St Etienne). Goal! Paris Saint Germain 4, St Etienne 0. Edinson Cavani (Paris Saint Germain) right footed shot from outside the box to the bottom right corner. Assisted by Maxwell. Goal! Paris Saint Germain 3, St Etienne 0. Zlatan Ibrahimovic (Paris Saint Germain) right footed shot from the centre of the box to the centre of the goal. Attempt missed. Zlatan Ibrahimovic (Paris Saint Germain) right footed shot from the centre of the box misses to the left. Attempt blocked. Javier Pastore (Paris Saint Germain) right footed shot from outside the box is blocked. Javier Pastore (Paris Saint Germain) wins a free kick on the right wing. Foul by Franck Tabanou (St Etienne). Attempt blocked. Max Gradel (St Etienne) right footed shot from outside the box is blocked. Assisted by Franck Tabanou. The real Zlatan: Why be like everyone else?